This summer has been one of the hottest on record in Shanghai. Taking a walk outside is akin to being skewered on a spit and basting in one's own oil on slow rotation . Luckily, I was in Ethiopia for most of July and missed the worst of it. While I did endure two days in the Dallol region of Northern Ethiopia- known as the hottest and most lifeless place on earth- my friends here are unimpressed, "Well you didn't have to leave Shanghai for that". The only window of respite is in the wee hours before seven in the morning, when the streets are most peaceful. Before the sound of blaring horns fill the air and a thick blanket of humidity descends, the elderly are out on their morning walks, exercising in the park and picking up breakfast for loved ones still sleeping. It used to be that at the entrance of every longtang, a small alley of traditional shikumen houses, there was at least one stall serving traditional Shanghai breakfast of the "four heavenly kings" 四大金刚. These are soy milk, youtiao (fried dough sticks), cifantuan (sticky rice ball), and dabing (big pancake). But most of these are now gone and replaced by booming bakery chains like 85 Degrees and Paris Baguette. The few that do remain are clustered around the Nanjing West Road/Jingan area and do brisk business serving locals who still prefer traditional tastes over Western baked breads and cakes. But just as quickly as they set up at dawn, they are packed up and gone again by the time they sell out, most days by 9 in the morning. You snooze you lose. As most of these stalls are being squeezed out by large chain bakeries, the Four Heavenly Kings are increasingly hard to find. Making traditional breakfast foods like youtiao is laborious work, with small margins. One piece of youtiao only sells for 1 RMB, but requires hours of production and litres of oil. Interestingly, the government has taken up subsidizing several hundred standardized breakfast stalls around the city, to ensure quality of oil and food production methods while maintaining local food traditions. There is an entire website dedicated to this initiative (http://zc.scofcom.gov.cn/), a move to shift perceptions of food safety in China, at least in the realm of street food. These have been generally well received, but there's just something about the bright yellow government-issued banners exclaiming "Every wonderful day begins with breakfast!" that makes me want to walk in the other direction. Some breakfast stalls however, have been in operation for decades, proving that dedication to quality and traditions don't go unrewarded. Below are a few of them. These are within walking distance of each other and create a nice walking tour of Shanghai's breakfast street food, a great way to get acquainted with morning life in Shanghai. Start at the corner of Xikang Road and Nanyang Road, where you will see a line outside an unnamed storefront at No. 100 Nanyang. This spot has been turning out some of the best cifantuan for over twenty years. They're open daily from 5:30am to 10am or whenever they run out of ingredients. The lady makes these at lightening speed, and the wait is never more than ten minutes. Most people are buying five to ten at a time, bringing them back for family or coworkers. 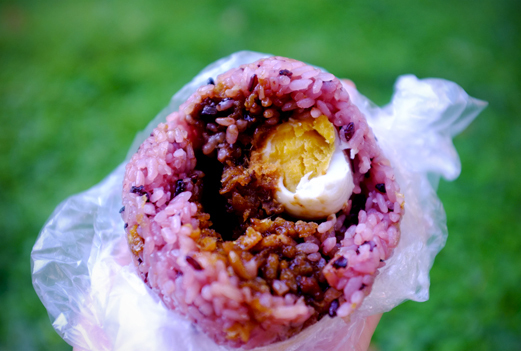 Cifantuan are essentially sticky rice wrapped around a fried dough stick, stewed pork and egg, pork floss, pickles, and whatever other condiments are available. Its sort of an all in one comfort food with the added portability of fitting in your palm. What could be better than that? This one has a tea egg inside, you can also request salted duck egg. I preferred the one with salted duck egg as it provided an extra layer of savouriness which I appreciated. Next, continue on down Xikang Road until you hit Nanjing West Road, and head East. At 1025 Nanjing West Road, head down the alley into the gorgeous Jingan Villas, rows of old school Shanghai homes reminiscent of what a more refined Taikang Road might have looked like a decade ago. Enterprising residents have set up a few shops and eateries in the street level apartments but for the most part this maintains the feel of an intimate residential community. The place to go here is the famous 弄堂小混沌 Nongtang Small Wontons at No. 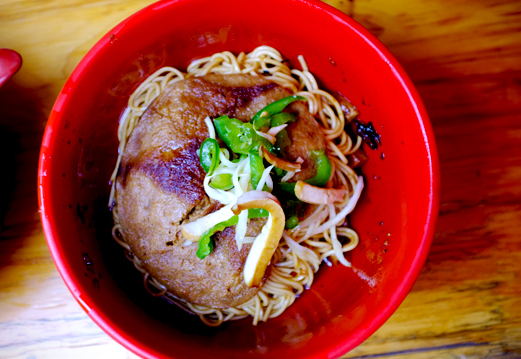 107, known for their small wontons and stewed pork cutlet noodles. These wontons are sold out before 11am every day and the shop closes around 2 in the afternoon. Another place I like is an unnamed store at No. 109, run by two ladies who dish out killer 排骨年糕 deep fried pork cutlet and rice cakes, another old Shanghai classic. Perfectly fried golden pork cutlets with a few pieces of rice cakes drizzled with sweet noodle sauce. These are a classic Shanghainese snack food, made with a pork cutlet deep fried to a golden hue, then topped with a few pieces of niangao (rice cakes) and drizzled with a sweet noodle sauce. At this point I'm sure you are licking the sauce off your fingers and asking, "Where to next? What else you got JT??" Continue south down the Jingan Villas until you emerge out the other side of this compound onto Weihai Road. Turn left and head east past Maoming Road until you see No. 590 leading down a small alley. Here you can find awesome dabing and deep fried rice cakes, dough sticks, and soy bean milk to wash it down. Deep fried bread, crullers, soy milk and pancakes. I like the savoury soybean milk, although you can ask for sweet. 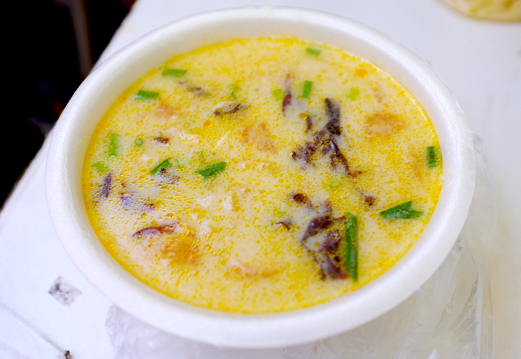 Fresh soybean milk is added to a base of crunchy pickles, scallions, seaweed, chilli oil and chunks of fried dough sticks. You can also order the same thing on a base of douhua tofu flower, a very soft tofu that melts in your mouth. Tip: Bring a bottle of water with you. Shanghai breakfast is a savoury affair, and by the end of this tour you will be thirsty. Trust me on this.